There are no prerequisites needed to attend this course. Students Students must be able to demonstrate an ability to read and write in English. As per 3316.9.2.1 of the 2014 NYC Construction Codes, this course is required by the New York City Department of Buildings (DOB) for individuals who supervise workers attaching or detaching articles from the hook of hoisting equipment and signalpersons communicating with such in New York City. This training is geared for construction foremen, riggers, safety supervisors, rigging inspectors, and personnel in charge of rigging operations not hired directly by a licensed rigger. During this 32-hour course, students will be provided with an overview of OSHA and DOB policies, procedures, and ASME rigging standards with a special emphasis on supervision and coordination of rigging crews and rigging equipment setup. 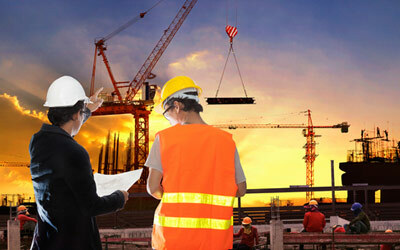 Some topics will include instructions on how to visually inspect rigging equipment, crane setup, load weight and center of gravity calculations as well as methods of applying proper rigging hitches. Students will participate in hands-on exercises in which they will be responsible for presenting, installing and using various rigging applications. Hands-on assessment will be made by instructor to determine if each student is capable of applying rope knots, inspect rigging hardware and apply learned rigging lifting techniques and immediately prior to the end of course students will independently complete a multiple choice final exam. 100% attendance and active participation in all learning activities including hands-on class exercises and the final exam is required. Students must earn a score of 70% or higher on the written and practical examination to receive a 32 Hour Rigging Supervisor id card. This card is valid for 4 years. Students who do not pass the written or practical exam will have one opportunity to retake the entire 32-hour course and retake the exam at a reduced fee of $200. Students must contact TSCTA to schedule and pay for the retake class within 6 months following the original class date.